Journal of Psychology and Behavioral Science is an interdisciplinary international journal that publishes empirical research and theoretical articles in applied areas of psychology and behavioral science. In addition, interdisciplinary research that integrates psychology and other fields is also solicited (e.g., psychology and law, psychology and consumer behavior, psychology and religion). It contains articles pertaining to theoretical integration of ideas, epistemology of social and biological sciences, and original empirical research articles of general scientific value. All research articles in this journal have undergone initial editorial screen and rigorous peer review. 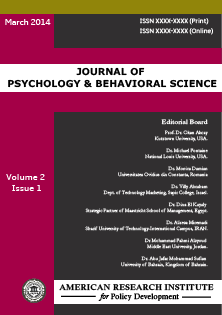 Each paper published in Journal of Psychology & Behavioral Science is assigned a DOI®number, which appears beneath the author's affiliation in the published paper. Click HERE to know what is DOI (Digital Object Identifier)? Click HERE to retrieve Digital Object Identifiers (DOIs) for journal articles, books, and chapters. Dr. Eric Klein, Department of Behavioral Sciences, Ashford University, USA. Dr. Mohammad Aziz Shah Mohamed Arip, Department of Psychology and Counseling, Sultan Idris Educational University, Malaysia. Dr. Zainab Fotowwat Zadeh, Institute of Professional Psychology, Bahria University, Pakistan. Dr. Shadiya Mohamed Saleh Baqutayan, University Technology Malaysia (UTM), Malaysia. Dr. Zeenat Ismail, Institute of Business Administration Karachi, Pakistan. Dr. Zeinab Mihandoost, Azad University of Ilam, Iran. Dr Chinyelu Nwokolo, Department of Guidance and Counselling, Nnamdi Azikiwe University, Awka, Nigeria.